You might think from reading this blog that every dish we make is a tasty success but let me tell you right now that isn't the truth. Take last night's dinner for instance. This dish wasn't a total failure, the stuffing was actually pretty good, the problem was the squash. We decided to try a variety that was new to us called Buttercup & its flavor did not blend well with the stuffing at all. I actually didn't care for its flavor on its own either and am wondering if the squash was a bit off. I do think the idea of this recipe was good though & would make it again but I'd use an acorn or butternut squash instead. Our stuffing here is really pretty basic. I didn't add any seasoning to it because the Italian sausage is so flavorful. Matt makes our Italian sausage and adds plenty of fennel, garlic and red pepper flakes. If your sausage doesn't have as much flavor add some of these seasonings to the stuffing. A note on the greens, we blanch then freeze chard and kale when they are in season to use all winter so it is already wilted & ready to use. If you use fresh chard add it to the hot sausage & rice & let it wilt in the pan. Put the wild rice in a pot with 2 cups water and bring to a boil. Reduce heat, cover and let simmer for 45 - 50 minutes until rice is tender. In a skillet over medium-high heat cook onion until tender. Add sausage cook through. Stir in the chard. Add about 3 tablespoons of the parmesan and stir. Scoop enough pulp out of the squash to make a bowl, leaving about 1/2-inch around all of the sides. Stir the removed pulp into the stuffing. Stuff the squash with the filling. Top with the remaining 1 tablespoon of cheese. Bake for about 5 minutes until the cheese is melted. Sorry about the squash :( But hey, it still LOOKS fabulous! what flavor did the squash have? just curious haven't tried that one yet. kat... your stuffed squash looks amazing. Cooking is trial & error; just one big experiment; but that is what I love about it. I love how you utilize all your summer bounty throughout the year. I've seen that variety of squash around, but haven't tried it yet. Bummer that it didn't go together, but the stuffing does sound wonderful, especially with the homemade sausage you described. Hey you did it, even if it didn't turn out as good as you expected. I'll try this filling soon, it sounds very tasty. LOVE the idea of blanching/freezing chard - it's one of my favorite veggies! Your photo of the squash is beautiful! 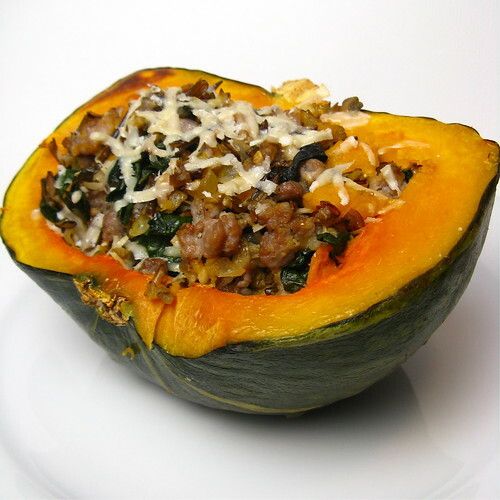 From my experience acorn squashes have been most successful with stuffing recipes. This looks great! Well, it sure does look pretty! At least the stuffing was good. I've never tried that variety - it's a shame when things don't work! Thar be a typo in yer recipe! Italian sausage instead of Italian squash. Thanks for the heads up Heidi.